The Static Reports and Forms Reporting feature allows you to create forms that your end users can fill out and submit from the CrisisManager mobile app for a specific event. If you would like more information on customizing your Static Reports and Forms, see the Static Reports and Forms - Advanced Customization page. Select the event to which you would like to add the Static Report. Click on Static Reports and Forms from the Event Menu at the top of the screen. 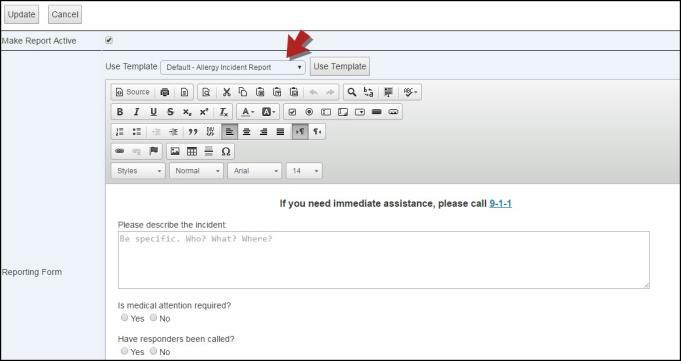 Click on the Edit button at the top of the Static Reports and Forms screen. Put a check in the box next to Make Report Active to activate this report. Select a Template from the drop down list and click Use Template. The form is now populated with your selected template. You can edit this template as needed and add your own information. Enter the Email Address of the individual that will receive the static report. You can add multiple email addresses by separating them with a comma or semicolon. Do not Require User to Have an Account gives every end user the ability to submit a static report from their mobile app. If this box is left unchecked, only registered users (those that have set up an account in the mobile app) will be allowed to submit a static report. Get User's Location will include the GPS location of the end user when they submitted the report. 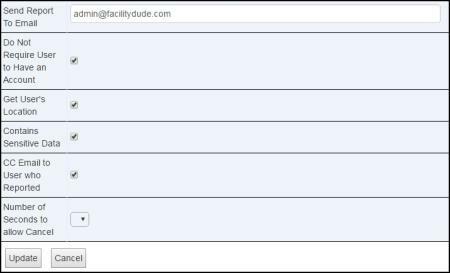 Check the box next to Contains Sensitive Data to have an email sent that states a static report has come through and to check the portal for details regarding the report. Check the box next to CC Email to User who Reported if you would like to send a copy of the report email to the user that submitted the report. Select the Number of Seconds to allow the user to cancel the static report. Click Update to save this static report. You must publish the plan for the static report to appear within the app. When the user opens the event with this static report in the mobile app, they will see an icon in the top right corner of the screen. 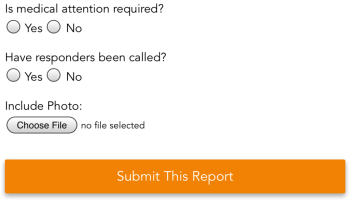 They will be able to tap the icon to open the report form, enter the information into it, and click the Submit this Report button at the bottom of the screen.